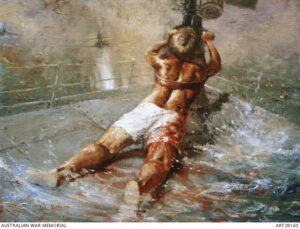 HMAS ARMIDALE (Lt Cmdr Richards) was sunk in the Arafura Sea by enemy aircraft on 1st December 1942 while on a mission from Darwin to Betano Bay in Timor. She was carrying 61 Netherlands East Indies troops, two Dutch officers, three AIF soldiers and a ship’s company of 83 RAN officers and seamen. During battle with the Japanese aircraft, ARMIDALE was hit by a torpedo and went down rapidly as the captain ordered “Abandon ship”. Ordinary Seaman Edward Sheean, a Tasmanian, returned to his Oerlikon gun and continued to engage the aircraft that were strafing his shipmates in the water. Of the total complement of 149 on ARMIDALE, one hundred men lost their lives. Sheean went down with his ship. He was Mentioned in Despatches.